Note: EagleTac renamed to EagTac in 2011. 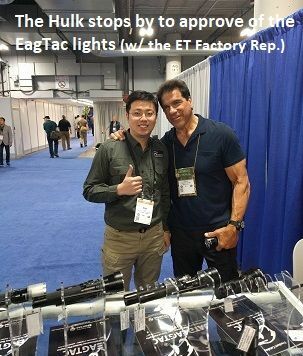 EagTac strives to offer customers the finest, brightest, toughest, and most power efficient tactical flashlights ever made. And we stock the widest range of EagleTac/EagTac/SporTac models, LED choices, and accessories of any EAGTAC Dealer on the PLANET! which is based on head diameter of flashlight ("D" is smallest diameter, up to "M" series which is largest diameter). Then, by Battery Size (AAA, AA, CR123, 18650), Number of Battery (1, 2, more) ~ smallest light to largest light. More Info. ALL other models generally have more than one choice for battery type ~ thus, it is up to customer to purchase desired battery/ies and/or battery charger separately.